Liberty, Eagle, Morgan, Peace, Eisenhower and Sacagawea are a few of the better-known US dollar coins. Most are silver, but some are gold, while others are just “golden” in color. But to trace the origin of dollar coins, we must go back 500 years to a small town in Bohemia. 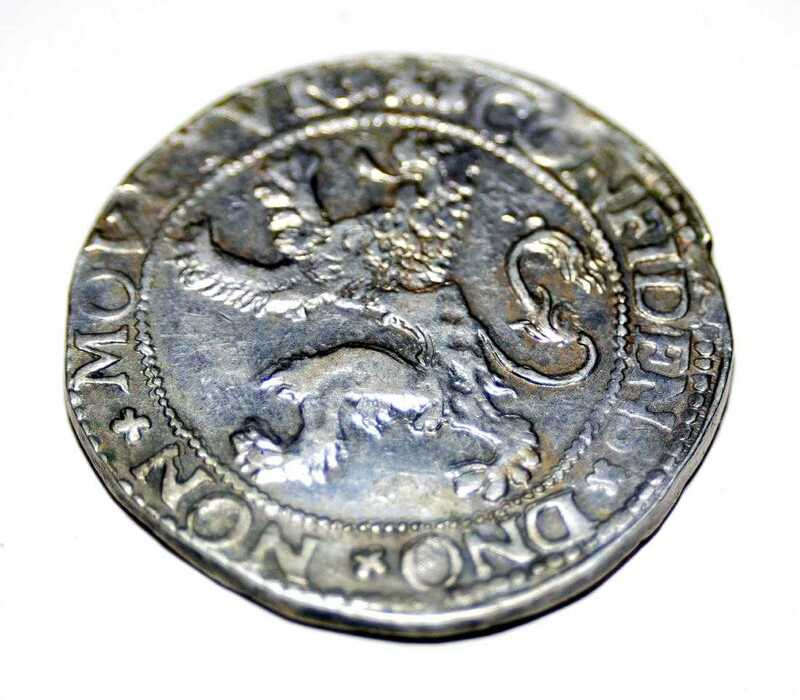 By 1518, the Counts of Shlick in the town of Joachimsthal in the Kingdom of Bohemia were mining their own silver to create the Joachimsthaler, their own local silver coin. 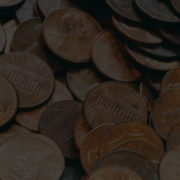 As the coin caught on elsewhere, it became known simply as a “thaler.” Over time,”‘thaler” was translated as “dollar,” which became the official currency adopted by the new United States and eventually by at least 20 other countries as far afield as Hong Kong, Australia and Liberia. Just as the US dollar is the most ubiquitous currency today, the Spanish dollar, or “piece of eight,” was the world’s currency beginning in 1598 and remained legal tender in the United States until 1857. It was equal to the thaler in size and weight but was more accessible. During the colonial era, England insisted that the colonies supply them with silver and reduced its silver coinage accordingly. The Spanish dollar filled the void until the Coinage Act of 1792 changed all that. 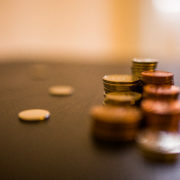 Once the US Constitution was adopted, the new Congress was able to provide more economic stability in the national economy through its standardized coinage. President George Washington signed the Coinage Act of 1792, which officially adopted the dollar as the national currency within a decimal system, making the United States the first country to do so. Mint marks were added to coins to show which US Mint produced them. Initially, there were nine US Mints, beginning with Philadelphia (no mint mark until 1980 when P was used). Subsequent marks were: C for Charlotte, North Carolina; D for Dahlonega, Georgia (1838-1861); O for New Orleans; S for San Francisco; CC for Carson City, Nevada; D for Denver (1906-present); M for Manila, The Philippines; and W for West Point, New York. A total of eight silver dollars have been issued by the US Mints since 1794, with the American Eagle being the most recent. 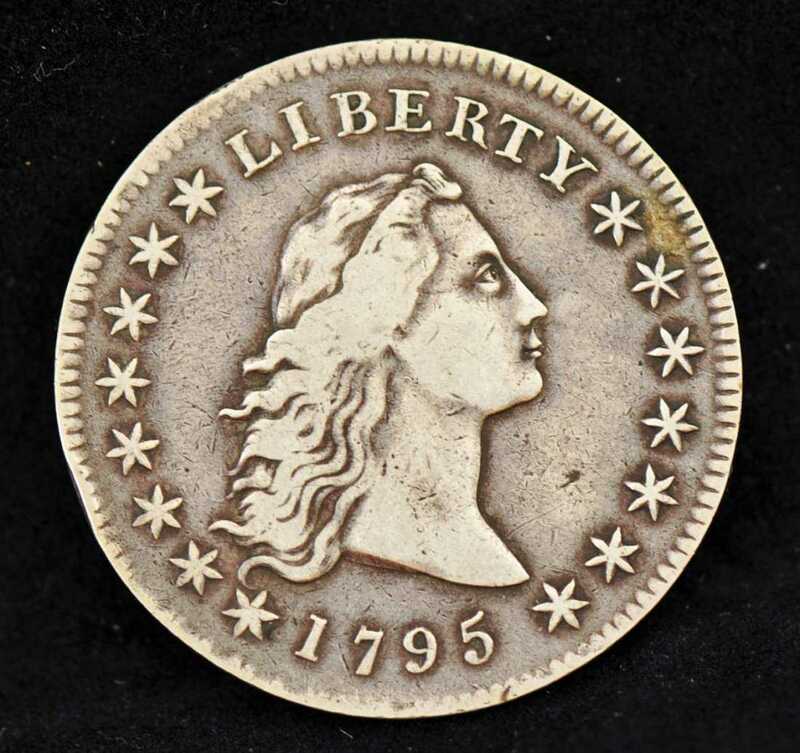 The Flowing Hair Dollar was the first official dollar coin minted in the United States under the Coinage Act of 1792. It was intended to equal the Spanish Dollar in size and weight. 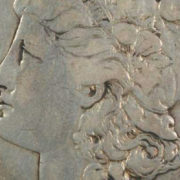 It became known as the Flowing Hair Dollar in reference to Liberty’s long hair that flowed past her shoulders, as designed by Chief Engraver Robert Scot. The coin’s composition was 90% silver (more than the 89.2% was required per the Coinage Act of 1792) and 10% copper. Only 1,758 of these silver dollars were hand-pressed in 1794, with an additional 160,000 or so minted in 1795, the last year of production. There is no mint mark. Lady Liberty was featured on the obverse with flowing hair to the shoulders showing a more open bust draped with cloth, as was the fashion of the day. It’s said that the model was from a portrait, possibly by Gilbert Stuart, of socialite Ann Willing Bingham, but it is not certain. The reverse is characterized by a small eagle on coins that were minted from 1795 to 1798 and a more majestic heraldic eagle on those examples minted from 1798 through 1803. The composition returned to the original official composition of 89.2% silver and 10.8% copper authorized by the Coinage Act of 1792. There is no mint mark. 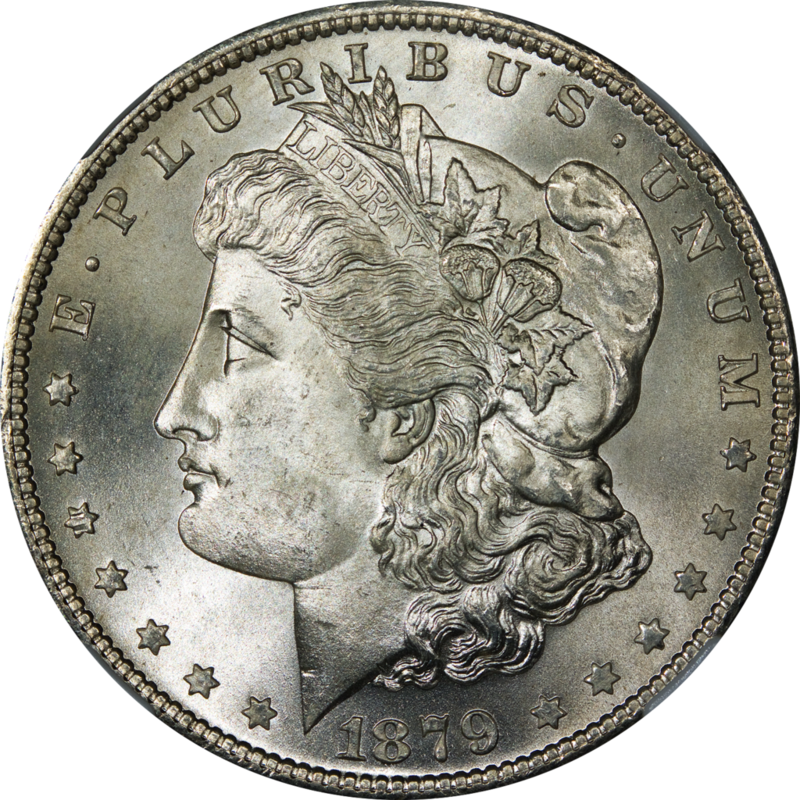 Silver dollars were no longer minted after 1806. There was a Draped Bust Dollar with an 1804 mint date, but it was actually struck in 1835 and intended only for official overseas gifts as part of commemorative sets. None were circulated, and only six are known to exist. Named for engraver Christian Gobrecht, the Gobrecht Dollar was the first silver coin to be reissued (in 1836) since the discontinuation of the Draped Bust Dollar in 1806. The design was a sitting Lady Liberty with a composition of 89.2% silver and 10.8% copper, as authorized by Congress in 1792. One of the rarest US dollars minted (about 1,000 may have been minted), the engraver’s name appeared prominently at first under Liberty, but later was reduced and finally eliminated altogether. It was discontinued in 1839, and is worthy of note that all Gobrecht Dollars struck in 1837 bore an 1836 date. There were restrikes in 1859 and 1860 that would show the eagle on the reverse flying straight rather than forward when tilted on its axis. 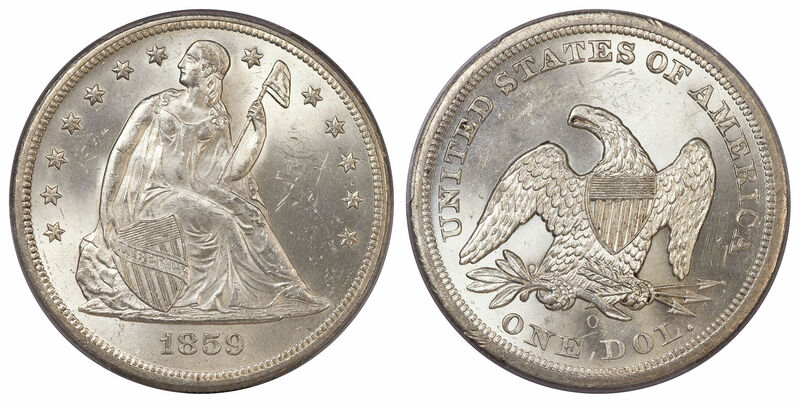 In 1840 a new silver dollar was minted with a seated Liberty engraved by Christian Gobrecht. It’s composition returned to the 90% silver and 10% copper of the earlier Flowing Hair Dollar and were struck at the Philadelphia Mint until 1846 when production included the New Orleans Mint (O), the San Francisco Mint (S) and the Carson City Mint (CC) after 1858. In 1866, the motto “In God We Trust” was added to the Seated Liberty Dollar for the first time. Production ended in 1873. The Coinage Act of 1873 stopped production of circulating silver dollars, putting the country firmly on the gold standard, where it would remain until 1971. A Trade Dollar was instead minted for use as currency, primarily for payment in trade to China and the Far East. It did circulate in the US as a coin for business transactions, but was unpopular because it traded for less than the $1 face value due to the low value of silver and was legal tender only up to $5. The circulation of Trade Dollars ended in 1878, with only proofs officially produced until 1883 (10 dated 1884 and 5 dated 1885 weren’t discovered until much later). Silver interests prevailed in returning the US to a silver coin with the Bland-Allison Act of 1878. 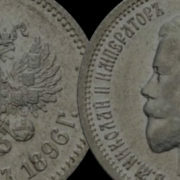 It authorized the minting the first new legal tender silver coins for circulation since 1873. Assistant Engraver George T. Morgan designed a Liberty Head on the obverse from a profile of Anna Willess Williams of Philadelphia, and an eagle and olive branch design on the reverse. It remained in circulation through 1904 and was again minted in 1921. It was the longest-circulating of all US silver coins. With the passage of the Pittman Act of 1918, silver interests again prompted government to strike a new silver dollar coin at a fixed price of $1 an ounce. About 270 million new silver coins were minted overall in the form of a Peace Dollar. So named for the word “Peace” under the bald eagle resting on a branch on the reverse, it symbolized the end of World War I in 1918. The coin’s designer, Anthony de Francisci used his wife, Teresa, as the model for Liberty on the obverse. Production was interrupted in 1928 until a new Congressional act allowed for additional coins, about 7 million, to be struck in 1934 and 1935, after which the dies were destroyed. Although this new American Silver Eagle was minted at three US Mints (Philadelphia, San Francisco and West Point), no mint marks were added for the bullion strike (bullion coins were kept mostly for trade). Only the proof sets that were bought by collectors were struck with mint marks. 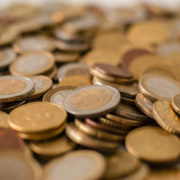 From 2006 to 2008 and again in 2011, a series of uncirculated coins was struck with the W mint mark. Special Issues such as the “Philadelphia Set” of 1993, the “Legacies of Freedom” set of 2004 and 10 other different commemorative sets included the American Silver Eagle coin. A 2008 version was struck on a 2007 die and is considered a rare error coin. A reissue of the Peace Dollar in 1964 was intended as a new circulating dollar coin, but objections were raised that the coin was intended mostly for collectors and was therefore a waste of Mint resources if it didn’t circulate. About 316,000 of the new silver dollars were minted in Denver, but they were withdrawn and subsequently melted down. No known example is said to exist (a private mint later struck a base-metal commemorative one). Only three gold dollar coin designs were struck for circulation in the United States, and only between 1849 and 1889 (commemoratives were struck between 1909 and 1922, but never circulated). Each was minted in 90% gold (about .048 a troy oz) and 10% copper measuring only about a half-inch in diameter. 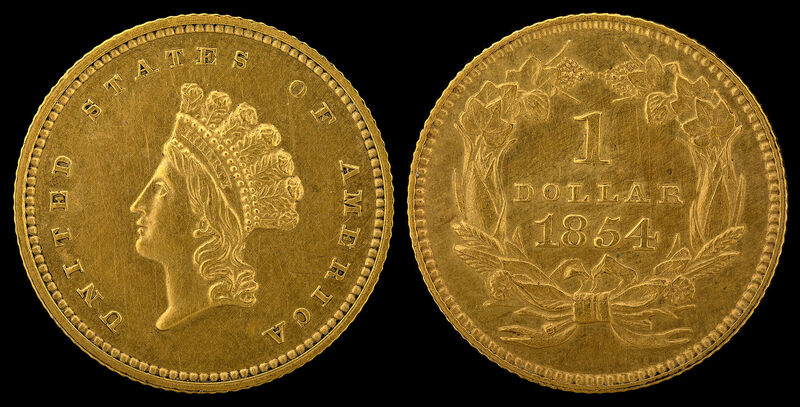 After much debate through the years, a gold coin was finally struck in 1849. Called “Type 1,” it was designed by engraver James B. Longacre to show Liberty with a coronet facing to the left and surrounded by 13 six-pointed stars. On the reverse was an olive wreath (some minted open at the top; others closed), the year 1849 and the legend “United States of America” and “1 DOLLAR” in all caps. There are five different design variations, one with an “L” for Longacre on the obverse. This coin, called “Type 2,” is similar in pattern to the Liberty Head, except the obverse shows a small head of an Indian princess with a feathered coronet on the obverse, with the legend “United States of America” along the rim instead of the 13 six-pointed stars. 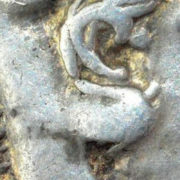 The reverse shows a larger wreath of cotton, corn, tobacco and wheat rather than the previous olive branches. Known as “Type 3,” the last gold dollar coin in circulation featured an Indian princess with a larger, more fully developed head with a fuller feathered coronet on the obverse (face). The reverse was very similar to the ‘Type 2’ design, both from Engraver James B. Longacre. There were four distinctive dollar coins struck in base metal, the Eisenhower Dollar, the Susan B. Anthony Dollar, and the two gold-colored ones known as the Sacagawea Dollar and the Presidential Dollar. None have circulated well and were discontinued after a relatively short time. 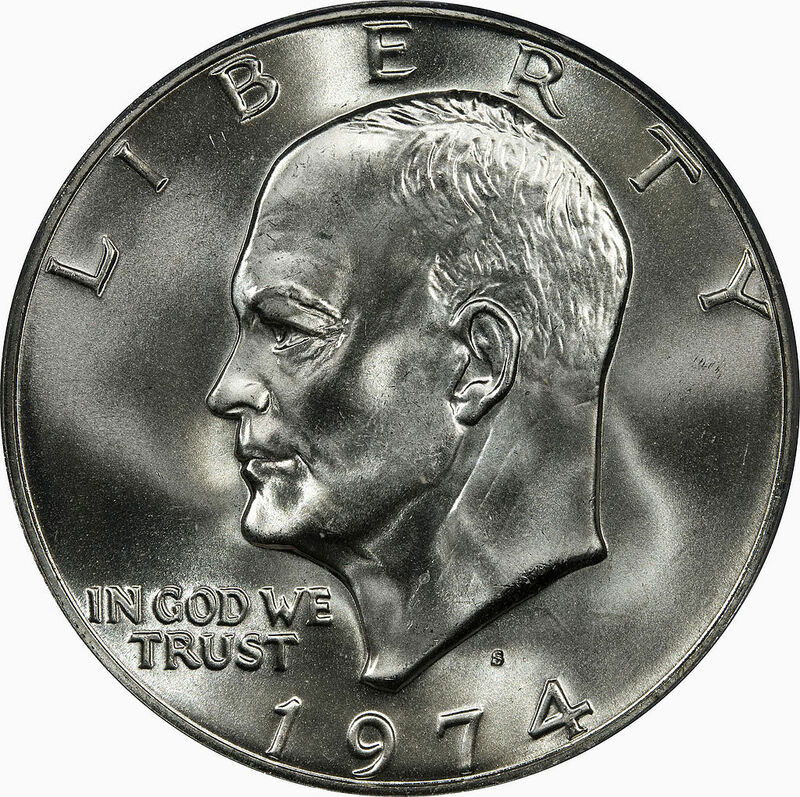 Newly authorized in 1970, a new circulating dollar coin featured a profile of President Dwight D. Eisenhower by engraver Frank Gasparro with the phrase “In God We Trust” on the obverse (a national motto adopted in 1956 during Eisenhower’s Administration). On the reverse was a tribute to the Apollo 11 moon landing of 1969 (Eisenhower had created NASA in 1958). The design was based on the NASA mission patch depicting an eagle clutching an olive branch near the surface of the moon, except for the years 1975-1976 when a Liberty Bell design was substituted to celebrate the US Bicentennial. The coin was a relatively large size at 1.5 inches and difficult for consumers and merchants to use. As a result, it was unpopular, except at casinos. There are silver and proof sets that collectors know as “blue Ike” (encased in a blue US Treasury presentation box) and “brown Ike” (encased in a brown presentation box with a silver Great Seal-type logo). A new dollar design was favored over the cumbersome Eisenhower Dollar with the image of 19th-century women’s rights advocate and anti-slavery activist Susan B. Anthony. Frank Gasparro was chosen to engrave her image on the new coin. The new coin would be only about an inch in diameter, just a shade bigger than a circulating quarter, and thus was often confused by consumers. The reverse continued the Apollo 11 tribute from the previous Eisenhower Dollar, sparking criticism that it had no relevance to Susan B. Anthony at all. The coin had a unique 11-sided border. 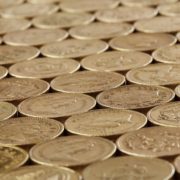 Overall, the coin was not well received and was used mostly by the post office, mass transit authorities and the vending machine industry. The 1981 strike of this coin is more valuable because it was issued mostly for collectors. The 1999 proof series and some 1979 and 1981 mint marks are also of collector interest. 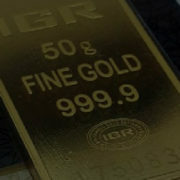 It is nicknamed “the golden dollar” because of the shiny gold-colored manganese brass that covers the mostly copper coin. The obverse features a three-quarter profile of Sacagawea, the Shoshone scout for the Lewis and Clark expedition to the Pacific in 1804, as designed by artist Glenna Goodacre. The reverse was a flying eagle design with a wide spread-wing design by Thomas Rogers. This coin design (with a smooth edge) would be in circulation from 2000 to 2008. From 2009 to the present, the reverse would feature a new design each year depicting Native-American life by different artists with a lettered edge of stars, the motto “E Pluribus Unum” and the strike date. As with the earlier base metal dollar coins, the Sacagawea Dollar was not popular in circulation even with a mass marketing program by the US Mint (even giving them away in boxes of cereal as prizes). However, they have proved useful for fare boxes and the vending machine industry. Another “golden dollar” with a similar composition of manganese brass over mostly copper as the Sacagawea Dollar featured each of the presidents of the United States in order of election beginning with George Washington. The entire series lasted until the Ronald Reagan presidential coin was struck in 2016 (living persons are not featured on coins), after which the program was discontinued. Coins struck from 2012 (Chester A. Arthur) were minted only for collectors. The reverse featured the State of Liberty by engraver Don Everhart with the motto “United States of America” and “$1.” Edging included the year, mint mark, 13 stars, and the legend “E Pluribus Unum” or “In God We Trust” from 2007-2009. Some Washington and John Adams dollars were missing the edging or had double edging, but there are relatively few, making them highly collectible.